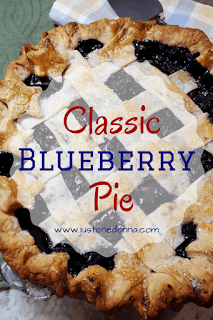 Blueberry pie has been one of my all-time favorite desserts. As pies go, blueberry battles for top billing with apple and lemon meringue. They each served as stand-ins for my birthday cake when I was a kid. I've always preferred pie over cake. Have you made a pie lately? 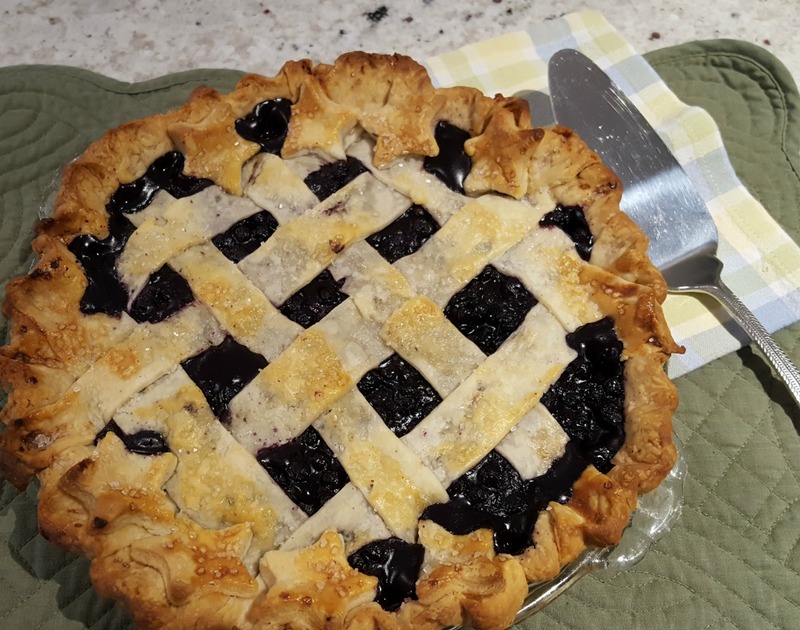 Any time of year is the right time to make a pie, but spring and summer are the best for all the beautiful fruits and berries that are available. If making pie crust gives you fits, try my recipe for food processor pie crust. It's easy as pie! 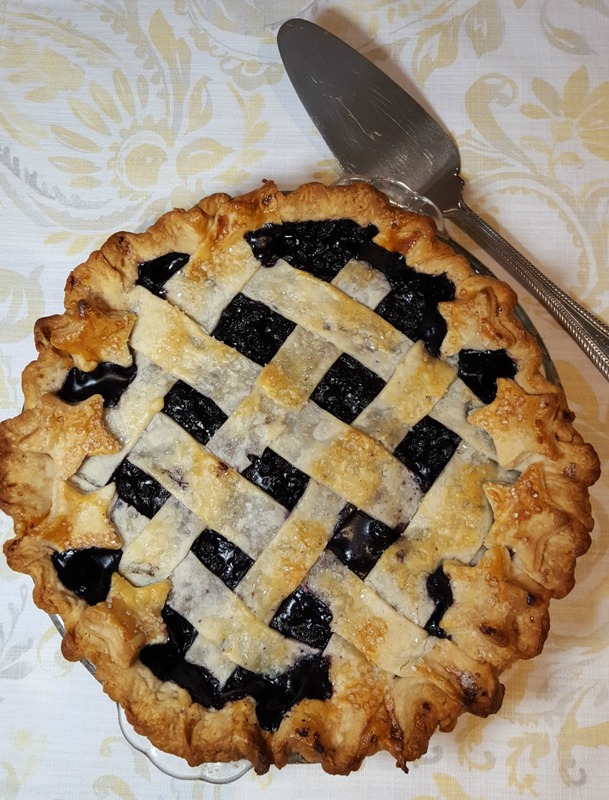 Blueberry pie can be a challenge when you are making it at home because thickening the filling's juice with the right mix can be a guessing game. I've started using Clearjel in my blueberry pie filling to take out the guesswork. The resulting filling holds together without being too thick. Clearjel is a modified cornstarch used frequently by commercial bakers. I buy my Clearjel from Amazon. Fresh blueberries make a delicious blueberry pie, but you can also make a yummy pie with frozen blueberries. Choose whichever is readily available and the most favorable price. You'll need to bake the pie with frozen berries fifteen to twenty minutes longer than with fresh blueberries. You want the filling to bubble, like in the picture above. Then you'll know your pie is ready. I like to make a lattice crust on my blueberry pies. It allows plenty of space for the steam to escape as the filling cooks and it looks pretty. I also like to embellish the crust with little pie crust decorations. You can buy pie crust cutters from several places. This set of star pie crust cutters is perfect for our summer patriotic holidays. This set by Chicago Metallic would be fun, too. Preheat your oven to 425 degrees F. Roll out the dough for your bottom crust so that it is larger than your pie plate. Grease your pie plate for easy removable of your pie slices when serving. Place the pie dough into the pie plate. Mix the sugar, cinnamon, and Clearjel together in a medium bowl. Place the blueberries in large bowl. Pour the sugar mixture over the blueberries and toss gently. Pour the blueberry mixture into your pie crust. Dot the blueberries with the butter and sprinkle the lemon juice over the berries. Place the pie in the refrigerator while you roll out the other pie crust. Roll out the top pie crust. Cut strips for your lattice topping, if using. Place the pie crust on top of the blueberries. Roll the edges of the lattice and the bottom crust together. Make a decorative edge. Roll leftover pieces of the pie crust to make decorative embellishments for your pie. Beat the egg and brush lightly over the crust. Use the egg wash as the glue for your embellishments. Sprinkle with the sparkling sugar. Bake the pie on the center rack of your oven for 15 minutes. 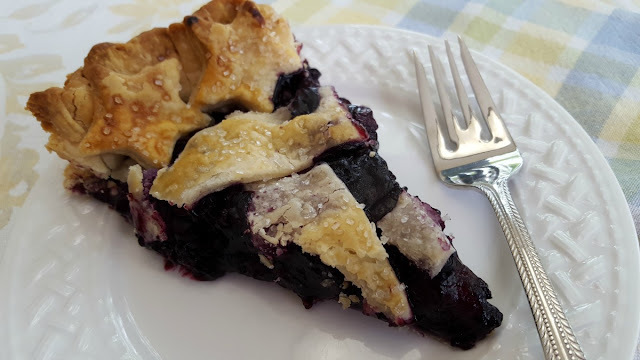 Reduce the oven temperature to 350 degrees F. Continue baking the pie until the filling is bubbly, about 50 minutes if using fresh blueberries and 65 minutes for frozen blueberries. Cool completely before cutting. I've created a Pies Pinterest board for lots and lots of pie inspiration. Check it out! Thanks for sharing this post on Pinterest, Facebook, Twitter, and Yummly. I do have to start making my own pie crusts again. I love blueberries. I've never used Cleargel and haven't heard of it but, I don't make a lot of pies. Is it better than cornstarch? I made a strawberry rhubarb pie yesterday and used cornstarch. It worked very well. Hi, Joanne. I'm a big believer in using what works for you. If cornstarch works, use that. I have never made a strawberry rhubarb pie but I think I should put it on my list. I know I will like it. When I do, I'll make it with the ClearJel and report back.